Some countries insist that you swap from summer to winter tyres as the cold weather approaches. But what are winter tyres? And why are they compulsory in some places but not others? Winter tyres have a higher natural rubber content which gives them a softer structure. The interplay between the tyres’ rubber compound and the road changes as temperatures rise. This affects the tyres’ grip. 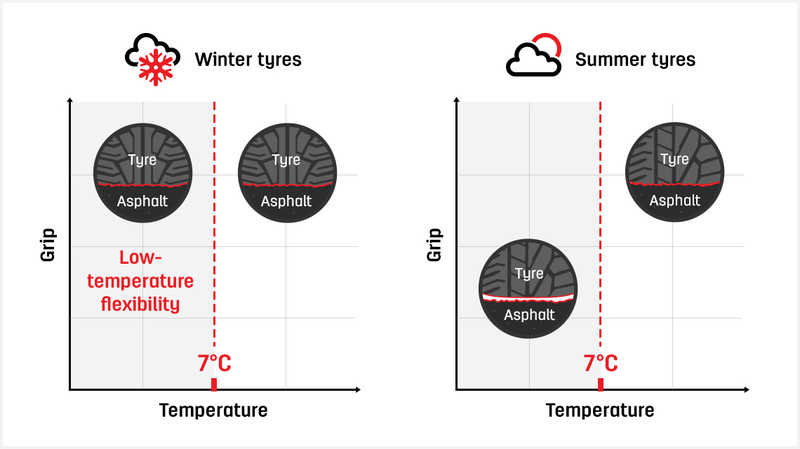 Summer tyres harden below +7 degrees C while winter tyres’ specially developed compound guarantees flexibility, even below +7 degrees C.
Their name suggests that they’re snow tyres whereas actually they’re cold weather tyres, capable of performing optimally on rain, ice, snow and dry, but cold, roads. Their softer compound makes it easier for them to grip roads at colder temperatures than summer and all-season tyres which are made of a harder compound. Their tiny grooves bite into snow, ice and sludge, dispersing water at a fast rate and ensuring better breaking and more traction. Meanwhile, deeper tread grooves gather and hold snow, to help with grip on packed snow, and help the tyres disperse water to reduce the risk of aquaplaning. What are winter tyres’ benefits? Winter tyres are excellent at gripping cold roads, whether they’re wet, dry, snowy or icy. Their extra deep treads are capable of dispersing more water, helping to reduce aquaplaning and improve handling. Because they offer greater safety in the cold, and maintain their flexibility, they are harder wearing than summer tyres and are therefore more cost effective. What are winter tyres’ disadvantages? Just as winter tyres are better in cold temperatures than summer tyres, summer tyres are better in warmer and more moderate conditions. Once temperatures rise above +7 degrees C you will need to be replace your winter tyres with summer tyres. Having a full set of winter tyres and a full set of summer tyres, including spares, can be costly – not only to buy but to store. In some countries, you have no option, while in others an all-season tyre may be suitable. Winter tyres are an excellent investment, if you live somewhere with extreme weather. For milder temperatures, or in countries where winter tyres are not compulsory, you may prefer to consider summer or all-weather tyres. What do the symbols mean on winter tyres? M+S stands for mud and snow and it indicates that the tyre’s tread pattern and tread compound have been designed to offer superior handling and braking in mud and snow, compared to a summer tyre. The M+S symbol appears on all-season tyres as well as winter tyres. The three-peak mountain snow flake (or 3PMSF) means that the tyres has passed a minimum required performance on snow, under EU Regulation 661/2009. This symbol only appears on winter tyres. What is a maximum speed rating? Tyres have different speed ratings, which need to be matched to the speed capabilities of the car. This is indicated by a letter on the tyre’s sidewall. A V, for example, means the tyre has a maximum speed of 240 km/h, assuming that it is correctly inflated and the car is not being overloaded. When it comes to winter tyres, you can fit one with a lower speed rating so long as you display a label, with your maximum speed limit clearly in the driver’s field of vision and you don’t exceed this speed. Uniroyal winter tyres are available in speed categories Q (160 km/h), T (190 km/h), H (210 km/h) und V (240 km/h).